Great redeemer, strong deliverer. Who in Wales can imagine the nation's rugby team without Gatland? A parting is only eight months away, but Gatland's mark on the game in these parts is sacred and indelible. With three Grand Slams, in 2008, 2012 and 2019, Gatland is the most successful coach in Five or Six Nations history, and leads the individual wins table too: with 43, 13 ahead of his nearest challenger, Bernard Laporte. For comparison, Clive Woodward, a World Cup winner, won 20. His last gifts in European rugby to the Principality were a first Six Nations title since 2013 and a 14th straight victory that edges Wales tantalisingly close to the world record of 18. 'Under-rated' is a label frequently applied to Wales's Kiwi coach, who finished his Six Nations reign exactly as he started it - by screwing England. In 2008, Gatland's debut featured a 26-19 win at Twickenham after Wales had trailed 16-6 at the break. Eleven years on, a new generation of Welsh leviathans crushed English hopes of a slip-up with a victory that nearly produced a 'nilling' of Ireland, whose fall from grace this winter has been alarming. How sweet for Wales to render the England-Scotland game hollow. Not bad for a "tiring" side, as England coach Eddie Jones called them. Instead, Wales were composed and concise, imperious and implacable. Ireland looked so unhappy you wondered whether they spent the week at the Cheltenham Festival, and backed a loser in every race. At least part of the reason for Ireland's hopelessness was Wales's ruthless intent from the start. No team can achieve such wins - no side can win a Grand Slam - without brilliant guidance from the helm. In a country of myths and legends, of folk hero fly-halves and daring wingers, Gatland has attained immortality by harnessing the emotional force of Welsh rugby and adding tactical shrewdness and hard-headedness. "I've got to have that belief and self-confidence in ourselves, and if I can project that on to the players in some way then hopefully they can believe it as well," he said. The tight game we expected went out of the window in the second minute when Gareth Anscombe chipped ahead for Hadleigh Parkes to touch down. Only in the dying seconds did Ireland put points on the board and spoil the perfect numbers of Gatland's last Six Nations outing with Wales. After the comeback win in Paris, he said: "We've become a side that's probably forgotten how to lose." Fightbacks against France should carry an asterisk to account for French flakiness, but Wales's told a story about them, and Gatland, as well as the eccentricity of the hosts. 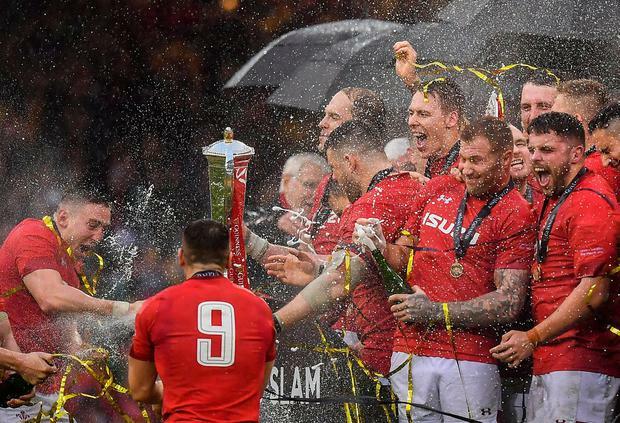 Gatland sent them out in the Cardiff rain without any sign that they had even considered the possibility the Grand Slam might be in jeopardy. "To be 12 years as an international coach - I've done six and it's nearly killed me, so I don't know how Gats has done 12," said Joe Schmidt, Ireland's beaten coach. Nobody knows where Gatland will turn up next but the end of the road with Wales is still a long way off. A colossal challenge looms. Wales, remember, have never reached a World Cup final, though they came close eight years ago, losing a semi-final 9-8 to France. A third-place finish in the inaugural tournament, in 1987, remains the high water mark for a nation now ranked No 2 in the world for the first time. Alun Wyn Jones, whose leg was twisted into a position a contortionist would have winced at - but somehow shook off the resulting injury - was the first to acknowledge that Wales can no longer slip into Japan this autumn as dark horses. "We've got to be aware that we've put a target on our backs," said Jones, whose physical contribution in this game alone justified Jonathan Davies's description of him as one of the all-time great Welshmen. In a perfect world for Wales, the final stop on the Warren Gatland farewell tour would be Yokohama, Japan on November 2, in the World Cup final. Gatland's work with Wales and the Lions already entitles him to a place in the coaching pantheon. But there is another level up from this, remarkably. Another grade higher than Grand Slams. And in this Welsh performance you saw the improved "game management" Jones talked about as a vital prerequisite for success. You saw hope for Japan. At the end Gatland wiped away a tear. Either that, or rain in his eyes. Afterwards, Jones said: "I don't want to be too romantic with him sitting here, but he alluded to the fact that when you've got someone so confident sitting at the top of the tree it filters down. "It takes a certain type of character to come through the mire and he's pretty much the guy who's done that. He's got a little bit left in his contract so he can't take his foot off the gas yet." But first - that long lunch, with no review necessary.